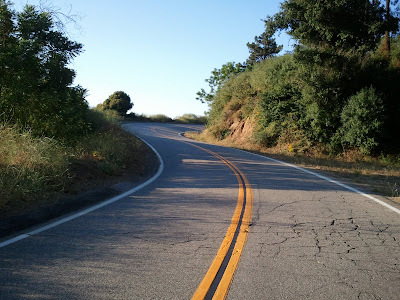 GMR is closed to motorized traffic from July 2 thru July 5. I decided to take advantage of this as GMR is a much different place when all the cars and motorcycles are gone. I set out by 6 am from my house and was at the maintenance shed by 7:30. There were very few riders out and the day was heating up quickly. I'm glad I left early. I did manage to ride a few miles with Mark. He caught me somewhere around Newman's and it was a nice temporary distraction. He's a Triathlete and is training for an upcoming Ironman. Good luck! Overall, the ride was quiet. It was very nice to be up in the mountains alone. By 8:30, I was dropping into Mt Baldy Village and by 9:15 I was home. What a great start of the day.